VertiRack's standard surfboard / stand up paddle board rack is a through bolt mount rack. This type of mounting is utilized by the person who does not need horizontal adjustability of the racks vertical rails to accommodate surfboards or stand up paddle boards of greatly varying length. 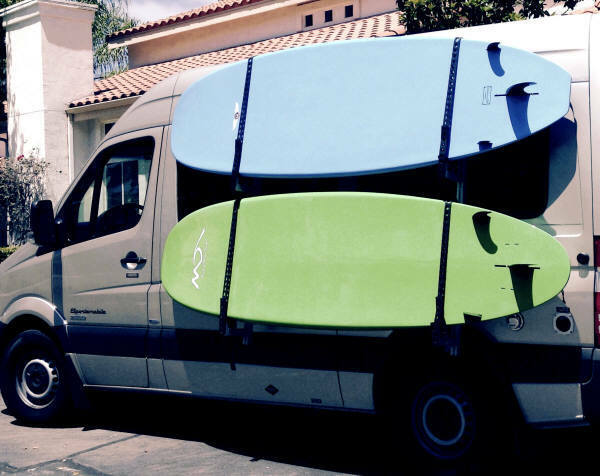 The through bolt method of mounting our surfboard / stand up paddle board is typically installed on a vehicle with a bare interior or during an unfit or retrofit. This surfboard / paddle board rack's support arms and board securing pad & strap are vertically adjustable to allow for varying width surfboards and stand up paddle boards.